Degree programs in legal studies and criminal justice, political science, public administration, and international relations also offer relevant training for careers in politics. Many politicians have also taken the legal path. In all, 25 U.S. presidents have been lawyers. Networking professionally and within the community is a key to success in politics. Many roads can lead to a political career. There is no one educational or career path to follow when pursuing a career as a politician. What will be needed to enter a political career is life experience, education, and networking — all of which future politicos can start developing while they are students in college. Many politicians have college degrees in law or business. Degree programs in legal studies and criminal justice, political science, public administration, and international relations also offer relevant training for careers in politics. Coursework in any of these programs can help those hoping to work in politics gain the organizational, communications, and leadership skills that are valued in the field. Many of the skills important for politics are also important for a wide range of professions. Whether holding an elected position as a legislator or working in a non-elected staff position, interpersonal skills are important because most positions require interacting with people. Written and verbal communications skills are also essential. Political workers may have to explain complicated legislative procedures to people who may not know much about them. Also, they often must persuade people to vote for a particular candidate or support a particular side of an issue. Written communications skills are critical for jobs requiring drafting press releases, speeches, or correspondence. Most importantly, people interested in a career in politics must understand how the political process works. A degree in business could be helpful for entering a management career in government. Coursework in business includes accounting, economics, and management. U.S. President George W. Bush was a businessman before becoming president, having earned a master of business administration from Harvard Business School. Meanwhile, courses in mass communications, journalism, marketing, and public relations offer students insight into how media impacts laws and culture. Psychology courses can help future politicians learn more about human nature and how to relate to others. Many politicians have also taken the legal path. In all, 25 U.S. presidents have been lawyers, including Thomas Jefferson, Franklin Roosevelt, and Barack Obama. A legal career can encompass many areas such as government, human and civil rights, international relations, law enforcement, and health care. 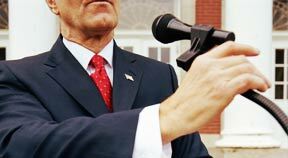 Many lawyers are adept at public speaking and debating, which are important skills for a politician. By working in politics and government, legal professionals can use their legal knowledge to influence change and help develop a better society. Fetterman has worked as an attorney and served as a judge advocate general in the U.S. Air Force. He was able to carry his legal and military experience into a career in government. Extensive networking into different community-based cultural groups can lead to political support. Whether working on the state level or the community level, Fetterman stayed active in politics. He says networking professionally and within the community is a key to success in politics. “Extensive networking into different community-based cultural groups can lead to political support, or at least that develops a ‘political intelligence’ network which can be utilized to see how campaign themes, etc., are being accepted by those groups,” he says. Possible networking opportunities include volunteering on campaigns, community events, political rallies, civic clubs, and school organizations. Established politicians can serve as mentors who are able to give advice and possibly recommendations for other opportunities. For those who have started in other careers but have political aspirations, it’s not too late — by identifying, developing, and leveraging their existing skills they can be on their way. POLITICAL CAMPAIGN BOUNDARIES IN THE PRESIDENTIAL ELECTION — DO THEY EXIST?